Developing a Qt application involves many different steps and stages. From configuring Creator to distributing binaries to different platforms, Qt provides many options along the way. Qt and Creator are configurable to compile applications on many platform targets and multiple platforms. Creator is the integrated development environment for developing Qt applications. Creator encompasses every step of application development from interface design to application testing and deployment. Alternatively, Qt may be installed on its own without the Nokia Qt SDK. For more information about the platforms supported and their installation pages, view the Supported Platforms and the Cross-Platform and Platform-Specific Development pages. Qt introduces an innovative alternative for inter-object communication, called "signals and slots", that replaces the old and unsafe callback technique used in many legacy frameworks. Qt also provides a conventional event model for handling mouse clicks, key presses, and other user input. Qt's cross-platform GUI applications can support all the user interface functionality required by modern applications, such as menus, context menus, drag and drop, and dockable toolbars. Desktop integration features provided by Qt can be used to extend applications into the surrounding desktop environment, taking advantage of some of the services provided on each platform. The Qt Modules page has a listing of the technology modules offered by Qt. Qt offers a unique event system based on meta-objects, signals and slots, and property systems. Qt offers several options with regards to user interface creation: widget based applications using layouts and Qt Quick interfaces with QML. In addition to Qt's Meta-Object System, Qt has several technologies that deal with inter-process communication. Qt has various support for different rendering and painting methods. Web applications are increasing in importance and abundance and Qt has WebKit support. Qt supports many utilities that work on multiple platforms. For more information, visit the Qt Tools page. Testing and debugging are part of the development process and Qt offers the developer multiple methods of testing their code. 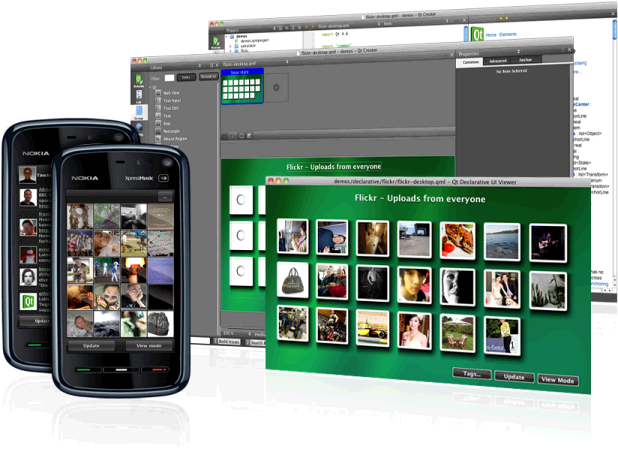 Symbian phones, Maemo devices, desktop environments, embedded Linux devices -- Qt applications are deployable to many environments. To deploy Qt applications onto multiple platforms, there are special considerations that each platform introduce. Deploying Third Party Libraries - deployment of libraries that are not under Qt's dual-license model. Creator can publish applications to Ovi Store directly. For additional information, visit the Cross-Platform and Platform-Specific Development and the Supported Platforms page.